We’d love your help. Let us know what’s wrong with this preview of The Art of the Swap by Kristine Carlson Asselin. Two girls trade places in time to solve a legendary art heist across two centuries! As the daughter of a caretaker for a mansion-turned-museum, twelve-year-old Hannah Jordan has spent nearly all her life steeped in the history of the Gilded Age of Newport, Rhode Island. The Elms, the mansion where her dad works (and they both live), is one of the most esteemed historical p Two girls trade places in time to solve a legendary art heist across two centuries! As the daughter of a caretaker for a mansion-turned-museum, twelve-year-old Hannah Jordan has spent nearly all her life steeped in the history of the Gilded Age of Newport, Rhode Island. The Elms, the mansion where her dad works (and they both live), is one of the most esteemed historical properties on famed Bellevue Avenue. Mysterious legends and priceless artifacts clutter every inch of the marble floors and golden walls, but Hannah is most drawn to the reproduction portrait of Maggie Dunlap, the twelve year-old subject of a famous painting stolen in a legendary art heist on the day of its scheduled unveiling in 1905. Hannah dreams of how glamorous life must have been for the young oil-heiress, Maggie, at the turn of the century, but she never expects she’ll have a chance to experience it herself… until the day a mysterious mirror allows the two girls to change places in time! In 1905, Hannah races to stop the art heist from happening—something she is convinced will allow the girls to trade back to their own eras—while in current times, Maggie gets a hilarious introduction to the modern digital age and a new perspective on women's roles in society while reveling in the best invention of all: sweatpants. So long corsets! To ask other readers questions about The Art of the Swap, please sign up. Hannah lives in Newport, Rhode Island in The Elms, a fabulous mansion from the Gilded Age. Of course, her father is the caretaker of the 1905 edifice, so she lives in a small apartment, but she does have the opportunity to roam around, and she loves learning about the history of the time, a fact which sometimes gets her into trouble with the docents! She is intrigued by the portrait of Margaret Dunlap-- the original painting by Mary Cassat was stolen the night of the unveiling party and never recovered, although there is a copy hanging in its place. When Hannah is investigating the fram while dusting, she finds the outline of a key on the back... and somehow, she is able to talk to Maggie. Even more thrilling is the fact that the girls swap places! Hannah is sure that this swap must be about the theft of the painting and sets out to investigate, with the help of the main suspect, a kitchen boy named Jonah. Maggie finds it harder to insert herself into Hannah's life, since she doesn't have the background knowledge that Hannah has about the people, and there are so many new technologies and clothes to deal with! The two girls communicate frequently and manage to find out the fate of the original painting, and try to find a way to unveil it in the present day. They try to swap back, but are stopped, and continue to work in the time they inhabit to make things right. Strengths: This put me in mind of both Tom's Midnight Garden, as well as Konigsberg's The Mixed-Up Files of Mrs. Basil E. Frankweiler AND made me really want to take a tour of the historic houses of Newport! The time travel method was highly acceptable, the mystery solid, and the relationahip between the girls very charming. Hannah's realization that the history she knows so well really did happen, and had some ramifications she hadn't fully understood, is well done and tempers her somewhat bratty personality at the beginning of the book. Maggie's awe at the freedom of modern girls and her embracing that freedom when she returns to her own time were both heartfelt and touching. There are a lot of art mysteries, but this wasn't as much about the art. Modern girls would do well to understand that the freedoms they enjoy have not been around forever, and this book is an excellent way for them to gain more details about women's rights and how they affected every day life. Weaknesses: This was on the long side. Since Maggie's exploits in the modern day are not as crucial to the plot, I think I would have gone a bit lighter on them. Asselin, Kristine and Jen Malone The Art of the Swap, 333 pages. Aladdin (Simon), 2018. $17. Content: G.
Hannah, 12, loves living in The Elms museum with her caretaker father. She does, however, sometimes get I trouble for correcting the docents in front of the patrons. Always fascinated by mystery of the missing portrait of Maggie Dunlap, the tween heiress who grew up in the home over 100 years ago. One day while looking at the replacement portrait, Hannah sees something in a mirror – Maggie! Wh Asselin, Kristine and Jen Malone The Art of the Swap, 333 pages. Aladdin (Simon), 2018. $17. Content: G.
Hannah, 12, loves living in The Elms museum with her caretaker father. She does, however, sometimes get I trouble for correcting the docents in front of the patrons. Always fascinated by mystery of the missing portrait of Maggie Dunlap, the tween heiress who grew up in the home over 100 years ago. One day while looking at the replacement portrait, Hannah sees something in a mirror – Maggie! When Maggie sees her, they can talk; but when they both touch the mirror, they trade places. Now Hannah is in the perfect position to solve the ages old mystery and Maggie can help on the modern end – while adjusting to a world where girls are allowed to run and wears shorts! I love a good time switch novel – from all the way back to Switching Well by Peni Griffin. Asselin and Malone keep the narrative interesting and moving while letting us see the challenges and success of each girl. If your students enjoy this one, you should recommend The Sixty-Eight Rooms series by Marianne Malone as a follow-up. I personally do not like books that alternate between the characters narrating the chapters. For me I just get into the flow of the story and wham I have to reestablish the story in my head and try to get back into reading. Then wham it happens again and again. I suspect there are many people like me and perhaps especially many young readers starting out. As a result I don't recommend this book. Oh, I loved this! Swapping identity stories are always so fun, but the dual time periods of this book makes it extra fascinating. Fun young teen historical switcheroo with some mystery solving thrown in. I recommend it for ages 8+. If you could switch places with someone, who would you choose? For Hannah Jordan, daughter of the caretaker at The Elms Mansion in Newport, RI, it’s Margaret, a.k.a. “Maggie” Dunlap, the young heiress who summered at The Elms in the early twentieth century. In a “Freaky Friday”-like time travel experience, Hannah no longer has to wonder what it was like to live in the Gilded Age. Her wish is granted when both girls appear on opposite sides of a mystery mirro Is the Grass Greener on the Other Side? In a “Freaky Friday”-like time travel experience, Hannah no longer has to wonder what it was like to live in the Gilded Age. Her wish is granted when both girls appear on opposite sides of a mystery mirror, completely swapping full-body identities – Hannah moving back in time, and Maggie leaping forward into the 21st century. Maggie is initially horrified to find that she’s wearing trousers instead of a dress, but rather enjoys the freedom of movement they allow! And what is the small rectangular object that vibrates and lights up with letters and a photo? She frets over how she will possibly be able to play soccer without perspiring. What would Aunt think about all this? Meanwhile, Hannah marvels at how much is exactly the same at The Elms in 1905, and quickly learns that she/Maggie enjoys many freedoms not afforded to those keeping the house running smoothly beneath her in the basement. She puts all her efforts into trying to prevent the commissioned painting of Maggie from being stolen in the famous 1905 art heist. Will Hannah’s best be enough? The girls can’t help but wonder if the grass greener on the other side. A temporary swap threatens to become permanent and the girls reflect on their old lives with yearning. In a race against time, Hannah and Maggie try to solve the mystery of the missing portrait without affecting the rest of history as written in the books. Spending most of my childhood summers in Newport: on the beach, walking through the shops in historic downtown, and visiting The Breakers and Rosecliff on school field trips, I appreciated all of the historical references embedded in the story, then and now. With equal parts mystery, science fiction, and ultimate girl power, The Art of the Swap, co-written by Kristine Asselin and Jen Malone, is a delightful title to seek on or after it’s Book Birthday on February 13, 2018. I had to power through a book hangover, when I started this, but I really enjoyed it. Maggie and Hannah were great characters with relatable strengths and weaknesses. It was interesting to see that even though they were so different, they were a perfect pair. I found it refreshing that this book featured two female protagonists and they weren’t whiny and didn’t waste time bickering. Maggie and Hannah responded to their time travel, in ways, that I felt truly fit their characters. Each made mistake I had to power through a book hangover, when I started this, but I really enjoyed it. Maggie and Hannah responded to their time travel, in ways, that I felt truly fit their characters. Each made mistakes and fumbled, although, they were able to regroup and stay on task. I liked that their experiences, outside of the time travel, were believable. Their were no quick fixes or miraculous abilities. They had to work with the skills they had and that was really interesting to see. It was also nice to see that each girl got to step up and take the lead. The book even addressed the weirdness of Maggie and Hannah’s situation after they time traveled and I thought that was a fun bonus. Jonah was a great character as well. He was easy to like and I though he was wise. The method of time travel was unique and I liked how it fed into the history of the story. The book also does a good job of incorporating women’s rights, pop culture, family, friendship, mystery and other typical tween situations. I really appreciate the authors, for all the additional resources, they provided at the end of the book. As for flaws, their was a point when I felt that the pop culture references were excessive and sometimes the slang dialogue felt forced. It also seemed like things wrapped up a little too easily, especially for Jonah. Overall though, this book was a fun read and I’m glad I was able to get my library to pick up a copy. What a delightful story. I loved every part of it. Hannah has the privilege of living in the stately Elms manor, a remnant of the Gilded Age of the early 20th century. She's big on history, and often gets into trouble because she knows more about the place than the docents who give tours. One day, she happens upon a hidden mirror which gives her a tiny window into the past. She sees Maggie, a girl her age from 1905 whose portrait Hannah has admired for many years. Both girls, full of curiosity, t What a delightful story. I loved every part of it. Hannah has the privilege of living in the stately Elms manor, a remnant of the Gilded Age of the early 20th century. She's big on history, and often gets into trouble because she knows more about the place than the docents who give tours. One day, she happens upon a hidden mirror which gives her a tiny window into the past. She sees Maggie, a girl her age from 1905 whose portrait Hannah has admired for many years. Both girls, full of curiosity, touch the mirror - and switch bodies. Hannah is magically transported to 1905, where her devil-may-care attitude is NOT proper. Meanwhile, Maggie now finds herself in a time with technological marvels such as cell phones, airplanes, and television. Both girls find themselves trying to solve a century-old mystery of a missing painting, not to mention how they're going to get back to their proper times! The amount of research the authors did is obvious - every detail was crafted with loving care. I adored the personalities of both girls, despite them being polar opposites. The character of Jonah, a servant boy who becomes embroiled in the mystery, was also wonderful. The story was full of suspense and intrigue and funny moments, and I found myself turning page after page in anticipation. Two girls live in the same mansion — centuries apart. One is wealthy beyond imagination, but living in an era that put tight constraints on the work, and worth, of women. The other is a modern child, the daughter of mansion’s manager, free to roam the house when it isn’t open to visitors, but relegated to live mainly in the attic apartment with her dad. One is the subject of a famous painting that was stolen almost upon completion, and the other wants to discover whatever really happened to it. Through the magic of the painting, they are able to trade places, in hopes of setting things right. Great premise, poor execution, as I found it hard to want to finish the book. It took me about three times as long as it should have to read, and I would have set it down for good except that I wanted to give it every chance possible. It is pretty clear from early on what the ending will be, and there are few surprises along the way. What the main lesson should be is that you can’t really change one part of the past without seriously impacting the future: in the end, only part of the “mystery” was discovered and redeemed, which made me feel like it all kind of fell flat. I was so happy I got this book. Normally, I don't read a lot of Middle Grade books, but what drew me to this book was the time travel aspect (one of my favorite genres) and the fact that we (the readers) not only get a view of the past from a present girl, but a few of our present from a girl from the turn-of-the-twentieth century. I cannot name all the parts of the book I liked, but here's some of the most that stand out (and I'll try to be discreet and not spoil anything). I liked when Maggie ( I was so happy I got this book. Normally, I don't read a lot of Middle Grade books, but what drew me to this book was the time travel aspect (one of my favorite genres) and the fact that we (the readers) not only get a view of the past from a present girl, but a few of our present from a girl from the turn-of-the-twentieth century. I cannot name all the parts of the book I liked, but here's some of the most that stand out (and I'll try to be discreet and not spoil anything). I liked when Maggie (in Hannah's body) tried to play soccer, and her view of the Mansion-turned-Museum when she first arrived. I also liked seeing the past from Hannah (in Maggie's body) point-of-view and realizing what girls couldn't do back then. Two girls living in a Newport mansion 100 years apart- and their lives intersect because of a famously stolen painting. On the surface they seem mismatched, but Hannah and Maggie soon find out they can work together to solve a mystery and change history. The mystery was intriguing, the setting breathtaking, and the differences they encounter by being swapped in time are entertaining. But what I loved the most was how Asselin and Malone made sure to highlight societal issues in both eras. From cl Two girls living in a Newport mansion 100 years apart- and their lives intersect because of a famously stolen painting. On the surface they seem mismatched, but Hannah and Maggie soon find out they can work together to solve a mystery and change history. The mystery was intriguing, the setting breathtaking, and the differences they encounter by being swapped in time are entertaining. But what I loved the most was how Asselin and Malone made sure to highlight societal issues in both eras. From class structure, to women's rights, Asselin and Malone carefully introduce inequality in the 1900s and present day America. This was a read aloud with my 7 yr old daughter and we both really enjoyed it. It was fun to read the comparisons of two different time periods and what each girl had trouble with or found most interesting in the "new" time. There were also a couple twists and some interesting problem solving that made it fun too. I didn't realize that so much of the story was based on fact (bits & pieces) until the end notes and that actually made me like the story more! This book came in our "The Guilded A This was a read aloud with my 7 yr old daughter and we both really enjoyed it. It was fun to read the comparisons of two different time periods and what each girl had trouble with or found most interesting in the "new" time. There were also a couple twists and some interesting problem solving that made it fun too. I didn't realize that so much of the story was based on fact (bits & pieces) until the end notes and that actually made me like the story more! 4.5 stars for this ARC. Thank you to Aladdin and Edelweiss for the opportunity to read this book before publication. In The Art of the Swap we have historical fiction with a mystery, an art heist and time travel. Yes, please. Really enjoyed watching Maggie and Hannah cope in their new environments. The mansion at the center of the plot is a real place and still a tourist attraction in Newport. Loved the ways the girls modeled friendship to each other and those they encountered during the swap. Hi 4.5 stars for this ARC. Thank you to Aladdin and Edelweiss for the opportunity to read this book before publication. Completely by chance, I read this book at the same time I was reading The Art Forger which created a unique and interesting experience. The Art of the Swap is a middle grade heist adventure shared by Hannah, who lives in modern times and idealizes life at The Elms during the Gilded Age, and Maggie, a young woman from the Gilded Age who struggles with living up to Completely by chance, I read this book at the same time I was reading The Art Forger which created a unique and interesting experience. 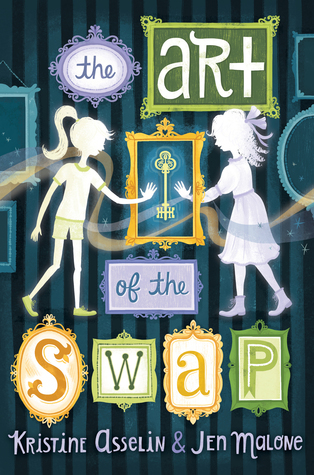 The Art of the Swap is a middle grade heist adventure shared by Hannah, who lives in modern times and idealizes life at The Elms during the Gilded Age, and Maggie, a young woman from the Gilded Age who struggles with living up to expectations society places on her. The two girls switch places; Hannah sets out to solve the mystery of Maggie's portrait that was stolen on the day of it's debut. Maggie meanwhile flounders in Hannah's world as she realizes that women have many more freedoms than she ever imagined. Since this is a middle-grade book, the actual solving of the heist happens fairly easily and quickly. The power of the book is in each of the girls realizing that they can have an impact on the world around them. The writing style is pretty straightforward and I really struggled with the laid-back and almost robotic dialogue. Fun time-swap story between a modern girl who likes with the caretaker of an old mansion and one of the original inhabitants of that mansion. Modern Hannah spends her time working on an old mystery that has persisted to her day, almost destroying a few lives in the process, while 1900s Maggie is forced into a high stakes soccer game and strange technology but also manages to work on getting them to swap back. Hannah's modern slang is very strong, sometimes to the extent of being a bit cray-cray. I love books where characters trade places, especially across different time periods. It was interesting to read the characters' reactions to the different time periods they jumped to. The end of the book came together really well and I liked the message. I wanted to give this book a 3/4 because at times it was a bit heavy handed in having one of the characters explain how things had changed between the two time periods. Also, the slang of one of the characters was a bit distracting at times. I loved The Art of the Swap!!! What a fun story with a feminist bent! The book is about two 12 year old girls who live in the same house ( a Newport Mansion later turned museum), but a century apart. They swap places, and in order to swap back, they must solve a mystery. With great writing, wonderful characters, time travel adventures, and lots of girl power - I highly recommend this middle grade book! What do 1905 and 2017 have in common? Two curious twelve year old time travelers. . . Interesting to see "what" technology was available in 1905 and what life was like for an "almost" teeenager after the turn of the last century. This is a MUST READ book if you like Mysteries or Time Travel!!! Maggie and Hannah switch bodies and time periods (between 1905 and the present day) and have to figure out how to get back to their own times and lives. While the solution turns out to be to solve an art heist, the jokes have been done and the plot advances at a glacial pace. Safe to read aloud in class, this story may interest the current 3rd grader who hasn’t seen Freaky Friday. Kristine Carlson Asselin's second YA novel FALLING FOR WONDER BOY will be out in February 2019, released by Wicked Whale Publishing. Asselin's debut YA novel ANY WAY YOU SLICE IT (originally published with Bloomsbury Spark, rereleased by Wicked Whale Publishing) is now available. THE ART OF THE SWAP (Simon and Schuster), co-authored with Jen Malone, came out in spring 2018. She has also published s Kristine Carlson Asselin's second YA novel FALLING FOR WONDER BOY will be out in February 2019, released by Wicked Whale Publishing. She has also published sixteen nonfiction books with both Capstone Press and Abdo Publishing for the school library market. She tweets at @KristineAsselin as well as her alter ego @QueryGodmother, where she tweets query tips and suggestions. She is represented by Kathleen Rushall of Andrea Brown Literary Agency.